For the safety of your pet, our customers, and our staff, Splash Your Pup requires first-time visitors to meet with a trainer for a one-on-one evaluation before becoming a regular Splasher. This evaluation is to determine the fitness level and demeanor of your dog. Your first swim involves an initial jump session with a dog swimming trainer who will get to know your pup. For your initial visit, we require an evaluation fee of $10 on top of the standard thirty-minute splash prices. At the beginning of your first appointment, you will be asked to sign a waiver, go over facility rules, and supply a copy of vaccines. During the orientation/swim test you will be familiarized with the facility so you know where dog clean-up supplies are, bathing station, and pool setup. We will then proceed to the pool and assess your dog's comfort level entering and exiting the pool and swimming skills. For puppies and dogs that have never swam before, a life jacket will be used for that initial appointment. We have a wide variety of life jackets available or you may bring your own. Schedule Your First Time Splash Orientation! First-time SPLASHers are required to swim with one of our Dock staff to ensure the safety of you and your dog. During orientation rules and safety precautions will be addressed as well as health history of your dog. No more than 2 dogs are allowed at the appointment. The overall swimming ability and desire of your dog will also be evaluated. If you dog is not willing to swim or jump, our knowledgeable staff will help you develop a lesson plan to encourage your dog to swim. All techniques during the orientation will be done through positive reinforcement. You can rent the pool for dock diving practice, to prepare for a competition, to exercise your pup, or just for fun! Our trainers are always available to help with any advice you might need. Splashes are thirty minutes, so please arrive promptly at your scheduled times to ensure maximum jump time. How Should I Prepare my Dog Prior to Arriving? Do not feed your dog 3-4 hours before a swim session. Make sure to potty your dog prior to swimming. There is a designated potty area on the front of the building. Anyone who does not clean up after their dog will not be allowed to use our facility. This also includes cleaning up after your dog indoors. 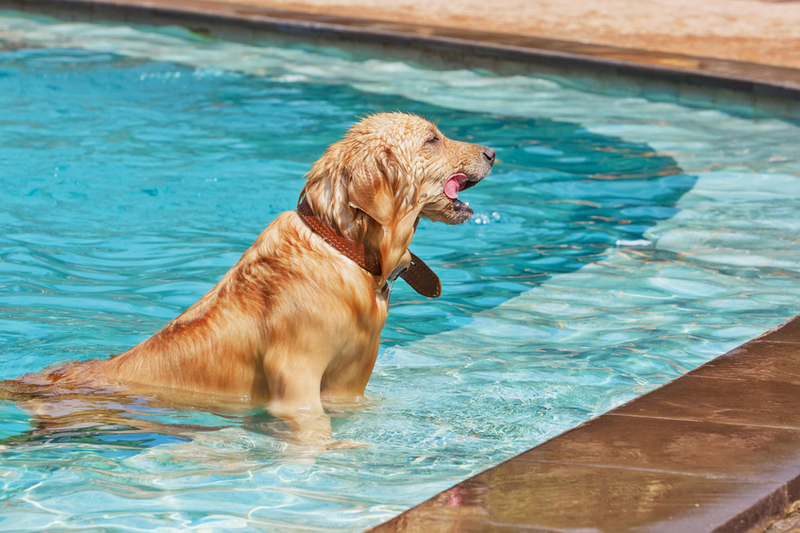 Dogs should be brushed out prior to entering the pool. Brushes are available for use in the wash/dry area. If the dog is dirty or muddy, you will be required to rinse your dog before entering the pool. Toenails must be trimmed with smooth edges. Nails will be checked prior to swim, and if trimming or filing is required, there will be a $10 fee. Sharp/long toenails can damage the pool. Defecation in the pool will result in a clean-up fee, that fee can range from $25-$150, depending on the extent of the stool in the pool and whether or not the pool needs to be shut down for the rest of the day. Session will end and no refund will be given. Dogs should be in good health and free of any communicable conditions. Be prepared to get wet – it is highly recommended you bring an extra pair of shoes, wear quick dry clothing, or a change of clothes. A drying station is available after swim and towels are provided. You can bring your own floatable toys, but there are also training aids available for purchase. We require a hard copy of proof of vaccinations. We require rabies and distemper, and titers are allowed. No exceptions - if you forget vaccine paperwork you will not be allowed to swim and will be charged a late cancellation fee of $20. Your vaccine paperwork will be kept on file and will be expected to be updated on due dates. You are welcome to bring children on the deck, but they must listen to instructions and not present a safety risk. Splash Your Pup staff may ask children to leave deck area if we determine there is a safety risk to the dog or children. No one under 18 is allowed on the dock without a parent or guardian present. No food or drink allowed on the dock. No treats on the dock. The reason for this is treats may clog the filtration system. Also, due to some dogs not chewing and swallowing treats it could be a choking hazard or cause your dog to swallow too much water.